A closer look at an idea that has received growing attention. Last week, the Center for the National Interest, a Washington-D.C. based think tank, released a new report on the prospects for trilateral cooperation between the United States, Japan and Vietnam. The report is one of several “Track 2” initiatives that have sought to explore opportunities for greater collaboration among the three countries over the past few years. These trilateral dialogues have become increasingly popular recently as the United States looks to supplement its existing network of alliances and partnerships with new linkages, including those between the U.S.-Japan alliance and other nations. The case for greater U.S.-Japan-Vietnam trilateral cooperation is clear enough, and the individual chapters of the report lay it out well. Economically, the United States and Japan have contributed significantly to Vietnam’s progress since the 1990s, and additional opportunities are available in fields like nuclear energy and Mekong sub-regional development more generally. All three countries are also part of the ongoing Trans-Pacific Partnership (TPP) negotiations which will hopefully be completed soon. Security-wise, the agenda is also quite rich given the common concerns Japan and Vietnam share on maritime security (especially given the East China Sea and South China Sea disputes) as well as humanitarian assistance and disaster relief (HA/DR). The momentum for trilateral cooperation has also been building steadily over the past few years. The U.S. rebalance to Asia, Japan’s ‘charm offensive’ in Southeast Asia, and Vietnam’s search for greater cooperation with other major powers has produced a level of convergence that has allowed the various legs of the triangle to strengthen further (See: “Japan’s ASEAN Charm Offensive”). Japan and Vietnam elevated their eight-year old strategic partnership to an Extensive Strategic Partnership in March 2014, while the United States and Vietnam inked a new defense agreement earlier this year which opens the door to future cooperation on defense trade and the co-production of military equipment (See: “US, Vietnam Deepen Defense Ties”). The U.S.-Japan alliance, long viewed as the cornerstone of regional peace and stability, has been revitalized of late with the two allies recently revising their defense guidelines. Yet there are still important limits to the development of greater U.S.-Japan-Vietnam trilateral cooperation. 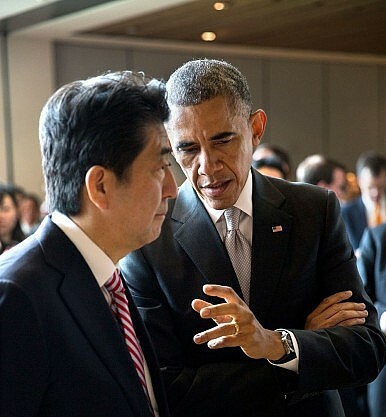 Structurally, attempts to use the U.S.-Japan alliance as a foundation for minilaterals pose their own challenges, particularly since the level of cooperation between Washington and Tokyo will often be significantly greater than that of each of them with the other partner in question, and bridging the gap is often not an easy task. Pursuing such an arrangement with Vietnam may be additionally challenging since, unlike say the Philippines or Australia, Hanoi is not also a U.S. ally and is very careful about calibrating its relationships between various powers including the United States and China. There may also be obstacles to realizing the very cooperation that could be a boost for such trilateral arrangements. In Vietnam, as Masashi Nishihara notes in the report, nuclear energy development has slowed recently due to safety and legal issues. In Japan, it is far from clear whether the legislation that Prime Minister Shinzo Abe needs to pass to boost Tokyo’s regional role even further can muster enough support within the legislature. That being said, there is no reason why these challenges cannot be overcome with time, particularly if current trends continue and all three nations are committed to taking important steps to advance cooperation. For instance, in their chapter on maritime security, Hoang Anh Tuan and Nguyen Vu Tung of the Diplomatic Academy of Vietnam suggest some bold initiatives that the three countries can take, including a proposal for the United States and Japan to create a dialogue mechanism with other Southeast Asian partners including Vietnam that includes not only policy discussions, but coordination and information-sharing as well. Some of the measures and mechanisms publicly proposed today – including U.S.-Japan joint patrols in the South China Sea– were difficult to fathom just a few years ago (See: “US-Japan Joint Patrols in the South China Sea?”). That they are being openly floated now is testament to just how much the Asian security landscape has changed in such a short time. That suggests that one should not underestimate the potential of newer arrangements like the US-Japan-Vietnam trilateral despite the challenges they may face today. Abe says Japan would consider patrols in the South China Sea, China isn't too happy about the suggestion.